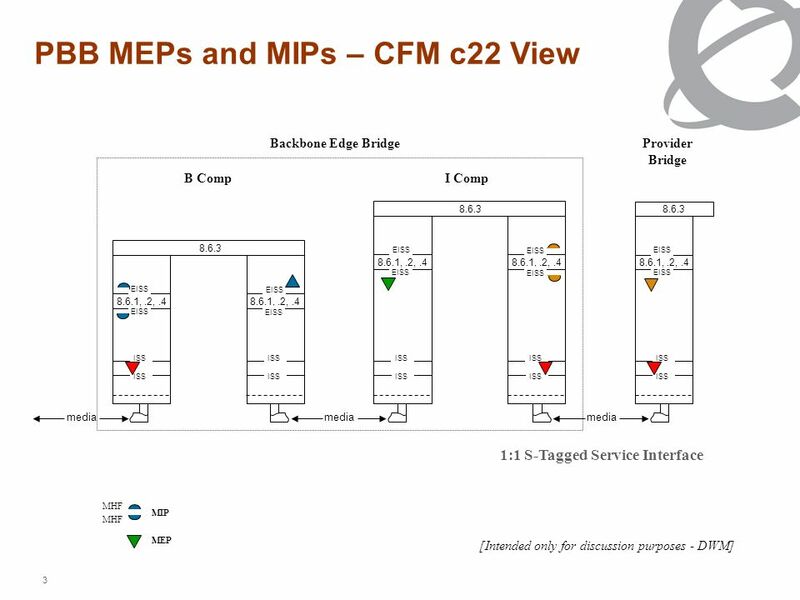 1 PBB MEPs and MIPs [Intended only for discussion purposes - DWM] MIP MEP MHF 1 35 1 35 B CompI Comp Customer MD Levels SP MD Service Level IB Link Access. 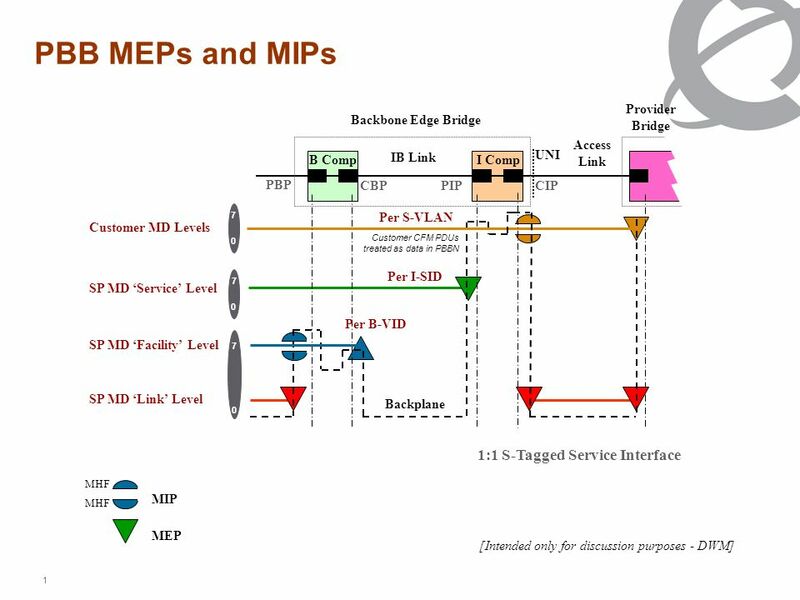 Download ppt "1 PBB MEPs and MIPs [Intended only for discussion purposes - DWM] MIP MEP MHF 1 35 1 35 B CompI Comp Customer MD Levels SP MD Service Level IB Link Access." Experiences with IEEE 802.1ah (Provider Backbone Bridges) Ronald van der Pol SARA Sep 2009NORDUnet meeting, Copenhagen. Ben Mack-Crane 9-Feb-141. 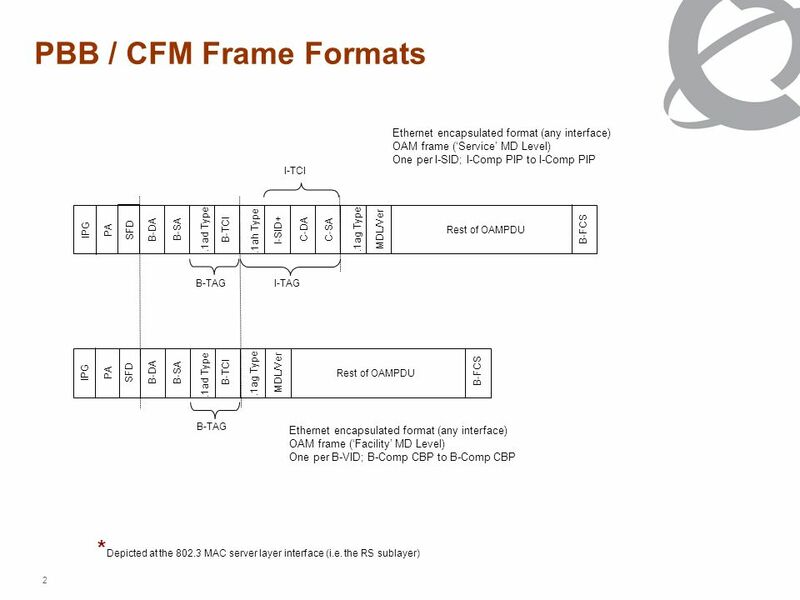 bp-sajassi-cfm-0711-v01.pdf Flow-Level CFM: CFM functions performed on the user flows. Network-Level CFM: CFM functions performed. Ethernet OAM Update Overview & Technical Aspects Dinesh Mohan May 18, 2004. M Vinod Kumar Problem with Peering PBBN. Introduction We present one problem related to Interop between two PBBN operators –We use packet flow in forward. Multi Domain Traffic Engineered Transport Networks (E-OTN, PTN) supporting P2P, P2MP, RMP and MP2MP Ethernet Services An overview of architecture and. Multi Domain Traffic Engineered Transport Networks (E-OTN, PTN) supporting P2P, P2MP, RMP and MP2MP Ethernet Services An overview of architecture and functionality. Nortel Confidential Information 1 VPLS OAM (draft-mohan-l2vpn-vpls-oam) L2VPN WG, IETF-71 (Philadelphia) Mar 13, 2008 Dinesh Mohan (Nortel) Ali Sajassi. 1 Introducing the Specifications of the Metro Ethernet Forum. 1 DRNI Examples and DAS position Maarten Vissers Version 01. Slide title 70 pt CAPITALS Slide subtitle minimum 30 pt Ethernet Routing for Large Scale Distributed Data Center Fabrics Dave Allan, János Farkas, Panagiotis. 1 Generalized EC Type 2 support EC Type 1&2 supporting bridges Maarten Vissers v01. M Vinod Kumar Dr. Abhay Karandikar. Multiplex Entity CBP PIP Towards Core Towards Core All fault indications are available on one port All fault indications. 1 Distributed Network Protection (DNP) architecture study Maarten Vissers v4 v2: includes a few slides at the end illustrating segment protection. Common OAM between IEEE 802.1 and TRILL November, 2012.